Marcus Law’s Kettering Town side increased the pressure on Evo-Stik League South Premier Division Central leaders Stourbridge with a 1-0 win over Royston Town at Latimer Park. The Poppies made a very positive start to the game, testing Royston goalkeeper Joe Welch numerous times in the first half. The best chance of this period came on 14 minutes, when a short free-kick was played to Lindon Meikle by Marcus Kelly. 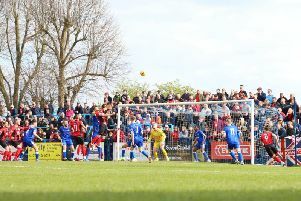 Meikle tested Welch from 25 yards out, with the goalkeeper parrying into the path of Aaron O’Connor, but the usually clinical striker blasted over from six yards. Although Kettering created many first half chances, Royston’s defence was resolute throughout the match. Centre backs Harold Joseph and captain Daniel Braithwaite both had great games, with some vital blocks and interceptions. The best of these came after 24 minutes, when a Michael Richens shot was blocked on the line by Joseph in the aftermath of a corner. In the second half, Kettering continued pushing forward. A close-range Dan Holman shot was deflected over after a neat one-two between Kelly and O’Connor on the hour mark, before Welch saved well with his feet when substitute Rhys Hoenes was played through by Holman seven minutes later. The breakthrough finally came after 70 minutes when Aaron O’Connor ran onto the end of a great through ball by Meikle. And this time there was no mistake as the forward slid the ball under Welch to make it 1-0 to hosts. Four minutes later Royston midfielder Sam Corcoran was sent-off after receiving a second yellow card for catching Richens with a leading arm. He had received a final warning from referee Andrew Genders in the first half whilst on a booking. The Poppies saw out the rest of the game, earning a valuable three points to aid them in their ongoing title race with Stourbridge while another positive for Law was the way that his team responded to the disappointing 3-2 loss to 10-man Biggleswade Town . Stourbridge slipped up losing 2-1 away to struggling Hitchin Town, surrendering an early lead, meaning that the Poppies go into their Tuesday night fixture at home to Coalville Town one point behind the Glassboys with two games in hand. Poppies: White; Kelly-Evans (sub Hoenes, 57 mins), Towers (sub Stohrer, 21 mins), Stanley, Rowe-Turner; Richens; Milnes (sub Solkhon, 83 mins), Meikle, Kelly; O’Connor, Holman. Subs not used: Knowles, Graham. Royston: Welch; Scott-Morriss, Joseph, Braithwaite, Newton; Green (sub Gordon, h-t), Thomas, Mentis; Corcoran; Murray, Neal. Subs not used: Oswick, Bola, Castiglione, Gallin. Goal: O’Connor (70 mins, 1-0). Bookings: Corcoran, Meikle, Mentis, Hoenes, Newton (all fouls). Sending-off: Corcoran (second bookable offence). Northants Telegraph man-of-the-match: Michael Richens – The Kettering’s captain’s value to the team was highlighted by the way Biggleswade ran the midfield on Tuesday with him missing. His return from suspension meant that Kettering won the ball more often than not and any flowing passing moves from Royston were stopped in their tracks. Richens once again displayed his quality and importance with a brilliant defensive display, and he would have had a goal to his name to go with it had it not been for some last ditch defending from Royston.